Meet JP, our Vendor of the Week! JP Koehler (on the left) of Home Maid Ravioli is our vendor of the week! A visit to JP’s tent is like visiting a long lost relative who is happy to see you and eager to feed you. If you are innocently walking by his tent you are unlikely to leave without a mouth full of cheese spread or artichoke dip and a smile on your face. 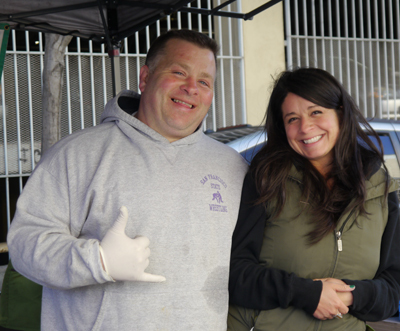 A master salesman, JP loves working farmer’s markets because it gives him independence and the luxury of spending his days outside in the sunshine chatting people up, meeting families and making people happy with samples and deals on his delicious pastas, dips and raviolis. Jp is known for joking with his customers and his positive energy is infectious. A San Francisco native, hailing from Noe Valley, JP has worked as a banker, a bouncer, and with the special needs tenants of a residential care facility. JP was also a high school wresting coach! 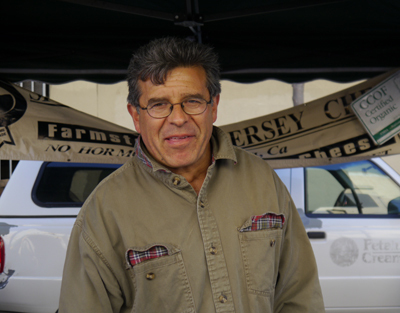 Come meet JP this Thursday at the market and enjoy some of his garlic cheese spread! Raul Vasquez is a cheese-maker from Toluca, Mexico. In Toluca, Raul’s family made queso fresco out of the leftover milk from the cows in his grandfather’s ranch. When he moved to the United States, Raul started working for Spring Hill Cheese and has had a chance to help make the cheese at all levels of production from cutting, packaging and hand labeling to separating the curds. Prepared with toothpicks, Raul has the most samples out of any vendor in the market! Some of his cheeses are fresh while others have been aged for several years. Raul can help you find a good staple like cheddar or discover a more rare variety like quark. 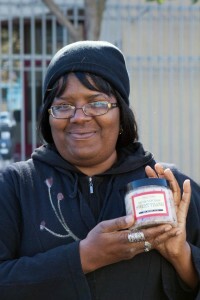 Spring Hill’s butter is AMAZING and you can try some this Thursday at the market!